Anemostat’s Door Products division has been making sleek, durable and functional door louvers for more than 40 years. The San Antonio, TX-based manufacturer builds fire-rated louvers, security louvers, storm-proof louvers, darkroom louvers and an assortment of standard-issue non-vision “Split ‘Y'” and “Inverted ‘Y'” louvers. The company’s extensive door catalog is just one of the reasons Anemostat Door Louvers have become a favorite within the U.S. door construction industry. Anemostat Door Louvers come with customizable features like galvanized steel, stainless steel, custom baked enamel paint colors, insect or bird screens and/or security screws. 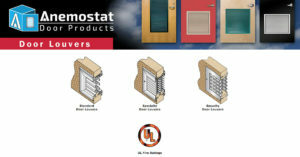 Anemostat’s Fire Rated door louvers come with a U.L. mark of 20, 45, 60 and 90-minute fire rating, and customers can choose from grey primer, beige or bronze enamel finishes on most louvers. Here at Jersey Architectural Door & Supply Co., we’re on a mission to supply our customers with the highest quality building materials on the market, so we rely on companies like Anemostat, who are in a league of their own in the door construction industry. We’ve been supplying the Tri-State area and the U.S. in general with the best door louvers out there for almost a century – just one quick visit to our Atlantic City showroom will prove this. And our team of in-house, factory-trained union carpenters are available now to install Anemostat door louvers in your next project. It’s just part of the reason why we’ve been rated South Jersey’s premier commercial and residential door supplier again and again. Our Tri-State area customers have come to know that can get them the materials they need, with the competitive prices and level of customer service they want. fusible link louver and non-vision inverted split “Y” louver designs. Security Door Louvers: Available in single-side security grille non-vision inverted split “Y” louver, and two-sided security grille fusible link louver designs. Specialty Door Louvers: Available in double inverted “V” darkroom louver, storm-proof louver, fixed-position thru-bolted “Z” blade louver, and fixed-position self-attaching “Z” blade louver designs. Have More Questions About Anemostat’s Catalog Of Standard & Specialty Door Louvers?